Heaven Is For Real is a the story of a little boy's trip to Heaven and back. Colton Burpo was only three years old when he had an emergency appendectomy. His doctors had told his parents for over a week that he had the stomach flu and after repeated trips to the hospital he is told he is fine and the family goes on a trip. However, the trip ends with Colton being rushed to the hospital fighting for his young life as the septic poison courses through his body from his ruptured appendix. The family is relieved when Colton is healed and they think nothing else of it until several months later when Colton begins to say things that make his parents become shocked by the words he speaks. Colton begins to say things that he has no way of knowing and his parents try to get out of him what his words imply. Colton shares many things with his parents, like how Jesus looked or his Pop as well as, he describes other people who he met there and he tells his parents he sat on Jesus' lap and was only dead for three minutes. His parents are confused, for the medical records do not state that Colton died at any time during any of his surgeries. 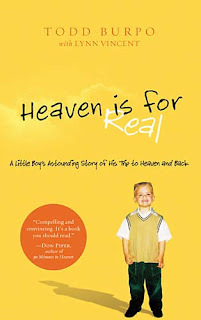 When Colton speaks of his sister who he met in Heaven, both his parents are now believing that maybe he did visit there, for they believe there is no way that Colton could know of their earlier miscarriage. They go on a mission to find out what Jesus looked like to Colton and none of the pictures they show him is right and they meet other children who believe they have traveled to Heaven and back. I'm not sure what to make of this book, as a fictional piece, it is well-written and easily read. It's a short read and told with innocence and wonder of that of a child. I found the family likeable and they were easy to read about. I'm not sure what to make of Colton's story though. His father is a pastor, could Colton have subconsciously over time picked these things up and shared them as he did? Yes, I do believe that is possible. It's just I found most of the things that Colton shared are things that we, on Earth, portray Jesus as. I would've been more impressed if he had shared something that wasn't common, just because its in a man made bible, doesn't make it true in the "real" Heaven. I do believe that children see things that we adults do not and maybe Colton did travel to Heaven as his parents believe, but there wasn't enough evidence there to state as full on truth for me. The miscarriage mention would have been unnerving to hear from his young lips and perhaps on that basis alone, I would've been inclined to believe him if he were my own child. I think it would have given more credential to his story if they did remember some of the names Colton gave for some of the people he met, but conveniently this wasn't the case. Sounds like a good read on a fictional standpoint...perhaps a tough read taken literally. I like to give people the benefit of the doubt, but it is tough. As they say, you just never know! Very good review. I may look into this book. My mom told me about this book. To me Heaven is very real. Thank you I can't wait to get this book. Great review. I have already read the book. It was very interesting. By the way, it is not a man-made Bible. Read 2 Timothy 3:16 - "All scripture is given by inspiration of God ..." and 2 Peter 1:21 "For the prophecy came not in old time by the will of man: but holy men of God spake as they were moved by the Holy Ghost." There are many more scriptures that talk about the divine revelation of Scripture.